Why the liquid N2 dry shipper, other than yrs truly in obstinate (I-will-carry-the-effing-thing-if-it-kills-me) mode? As I will report in subsequent bloggettes, we are trapping water vapour and other components of the hydrological cycle (precip, streamwater) as part of a new study on montane forest bryophytes (mosses, liverworts and hornworts). So more of the Helliker trap, and the newly devised Heliconia trap, anon. Upon preparing an overview of Silent Spring, as one of Clare College’s “Great Book” soirées, I was immediately taken back to my childhood. Memories of my WWF Panda badge and starter pack, my pressed flower collection (Sheet 1) (Sheet 2) (the second image having been overwritten by my mother as we laboured late into the night in preparation for display at Stroud Show), and JFK. (And yes, I can remember exactly where I was, and how I heard, but that is another story…). Within a few months of publication in the autumn of 1962, Carson had made a considerable impact giving evidence to his Presidential Science Advisory Committee. There is a wealth of biographical detail regarding her life and untimely death from cancer in 1964. But given the challenge of revisiting this book, how would I now evaluate her contribution, the impact of her work, and parallels for current environmental issues? When her cancer recurred, she must have had a realistic expectation for her own lifespan. She had been editor in chief for publications by US Fish and Wildlife Service until 1952, and then seen her own career flourish as a popular scientific author. How best to capture popular attention beyond the procrastination, prevarication and obfuscation of government bureaucracy, academic ecologists and agrochemical industry? Initially I was rebuffed by the opening chapters, which were couched in very emotive terms and lacked cross references. In Chapter 2, “Can anyone believe it is possible to lay down such a barrage of poisons on the surface of the earth without making it unfit for all life.” And later, “When the public protests… fed little tranquilizing pills of half-truths… false assurances… sugar coating of unpalatable facts”. Many of the audience took me to task for my criticisms. My argument had been that we all dress up and promote data for scientific publications to some extent, but would use a more conditional or hypothetical style “in this book, I contend….”, or “I set out to show…..” or “evidence will be presented to demonstrate/prove/convince…” Her style was also used in part as the basis for the widespread campaign to undermine her scientific authority and personal integrity, waged by agrochemical companies, politicians and the like. Subsequently, as each emotively titled chapter unfurls, the reader is won over by the sheer weight of examples, mostly cross-referenced to peer-reviewed papers or government reports. There are many devastating examples whereby entire catchments, counties and regions demonstrated catastrophic (with the emphasis on ‘-trophic’) declines in insects and terrestrial invertebrates, birds and mammals. These resulted from repeated and indiscriminate applications of compounds (DDT, dieldrin, aldrin, lindane, organophosphates) usually in a futile effort to control native or invasive insects. By 1972 many had been banned worldwide, or with use now controlled or restricted see (Stockholm Convention on Persistent Organic Pollutants). So what are the parallels for mass action? Perhaps one is the Montreal Protocol, which reached a global agreement to ban the use of dangerous chlorofluorocarbons only 18 months after the discovery of the ozone hole. But alternative compounds were available, and we all inadvertently bought in to their introduction with each replacement fridge or freezer. Another lesson is to realise how lobbying, spin and special interest groups increasingly shape political or popular opinion by campaigns of misinformation, prejudice or sheer financial greed- and to unpick the actual science which lies behind hype of campaigns waged by those ranging from Greenpeace to Exxon or Monsanto. My thoughts on the need to buy in to climate change, and act urgently to meet the cost of CO2 emissions, have been advocated on these pages previously. In conclusion, with the recovery of raptor populations in the UK, http://www.rspb.org.uk/Images/wingprayer_tcm9-188788.pdf, and US, we see the results of her whistleblowing. To what extent she accelerated the banning of these compounds is a matter of conjecture- maybe a decade? For those who suggest that her actions led to millions of deaths from malaria- well read the book, and the preface of the UK edition by Lord Shackleton, as both allude to the widespread occurrence of resistance to pesticides in malarial mosquitoes in the 1960’s. And the audience left me with the challenge of developing my own popular science legacy, for which this blog, and earlier postings, represent my initial tentative steps. The Quaternary Research Association (QRA) “Quaternary Revolutions” meeting was held during the first week of January in the august surroundings of the Royal Geographical Society (well worth a visit in itself!). I was presenting a poster based on a paper we published last year in Current Biology entitled Plants and Soil Microbes Respond to Recent Warming on the Antarctic Peninsula in which we developed a time series of past moss growth and soil microbial activity from a 150-year-old moss bank at the southern limit of significant plant growth based on accumulation rates, cellulose δ13C, and fossil testate amoebae. We showed that growth rates and microbial productivity have risen rapidly since the 1960s, at a rate unprecedented in the past 150 years, consistent with temperature changes, although recently they may have stalled. The conference had a great line up of speakers to celebrate the 50th anniversary of the QRA including Maureen Raymo (The Oceans, CO2, Sea Level and Ice: Four million years of natural climate variability), Phil Jones talking about the causes of climate change, Valerie Masson-Delmotte and Danny McCarroll on measuring climate change and the palaeo-ecologists Kathy Willis and Mary Edwards. As the conference took a somewhat retrospective approach, there were multiple mentions of scientists who, whilst working in the Cambridge University Sub-department of Quaternary Research (part of the Botany School 1948-1994), made huge contributions to the field of Quaternary Science and to the QRA. I will very briefly mention three of them…but do go and find out more as none can be adequately summarised in a sentence or so and there are more to add to the list! 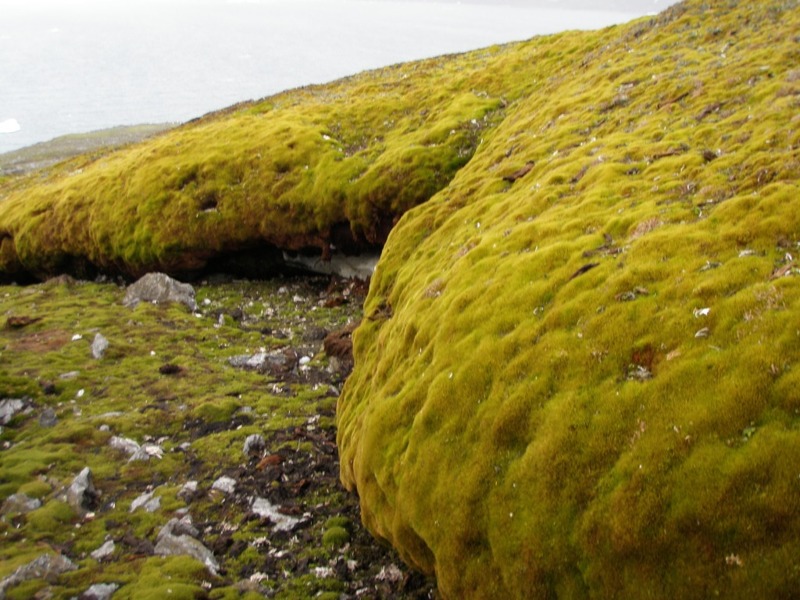 – Professor Sir Harry Godwin (1901-1985) was a plant ecologist and Professor of Botany who was an expert in palynology, ecological successions and the Fens, and after establishing the isotope laboratory provided much of the underpinnings to the interpretation of radiocarbon dates that is crucial to my own work on Antarctic moss banks. – Professor Richard West (1926-)was a student of Harry Godwin and a previous head of the department of Botany, which he integrated with a deep interest in Geology to become the foremost expert on interglacial and cold-stage palaeo-botany and stratigraphy. Broadly interested in Quaternary Science, Richard West was one of the founders of the QRA, which held its first meeting in Birmingham in 1964. 2010 stamp commemorating 350th anniversary of the Royal Society. Earth Sciences were represented by Nick Shackleton. – Professor Sir Nick Shackleton (1937-2006), a physicist who became a leading palaeo-oceanographer and made huge advances in mass spectrometry and the application of stable isotope analysis to understanding climate change and the extent of orbital forcing. By developing high resolution isotope stratigraphy, ‘astronomically tuned’ timescales were developed for geological sequences. 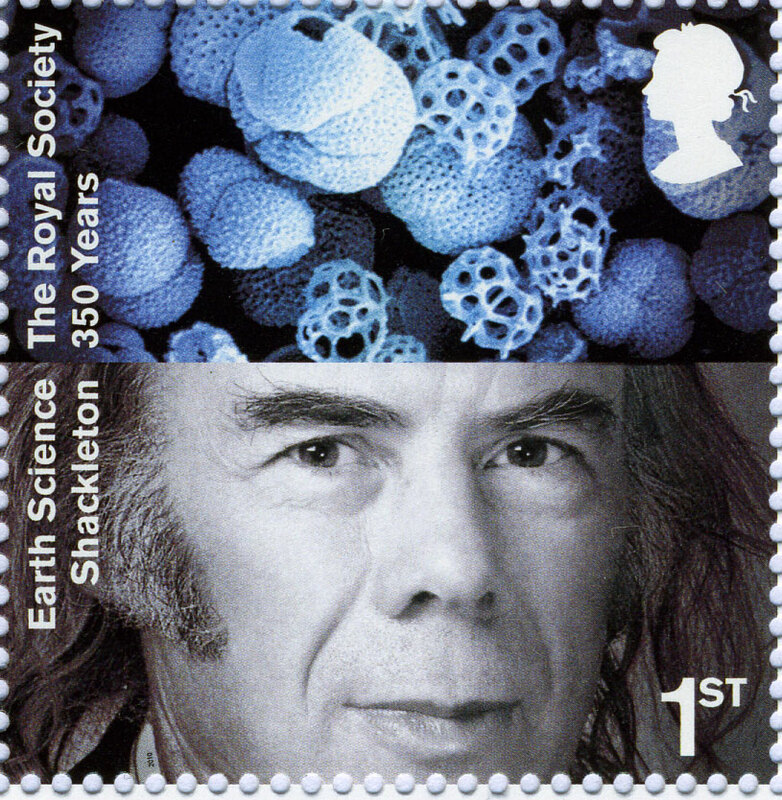 Such was the importance of Shackleton’s contribution that in 2010 that he was selected to represent “Earth Sciences” on a stamp in a series to honour the 350th anniversary of the Royal Society. As I battle with my own stable isotope data, and continue to make regular use of the analytical facilities in the Godwin Laboratory for Palaeoclimate Research, the QRA conference happily reminded me of these great scientists who have previously worked in and around this gingko covered building, and whose work is fundamental to our own. Hmmmm envelopes pushed, eh? Aching limbs from our quartering of the forests confirm, in part, urban dictionary definitions. Being enveloped by a convective shower, as dusk closes in on the trail, leads to focus on the climatic elements more than tropical forest zonation and updating Beard or Holdridge- but here we are in the Trinidad forests, and no mistake! The Northern Mountain Range extends E-W for ~40 km, with highest peaks from the strikingly isolated El Tucuche to the west, and Cerro del Aripo (940m) and massif towards the eastern end, from which a number of high afforested ridges radiate NE to S. The main E-W ridge drops steeply towards the Caribbean, and is subtended to the S by a number of parallel ridges and valleys. Perhaps 30% of the forest around the main ridge is designated as “reserves”. Most of the valleys to the west are largely populated, with degraded agricultural lands, and moving progressively east the valleys are increasingly dominated by relict plantations (mainly cocoa and citrus, some coffee) up to 350 m, and a number of limestone quarries. At the centre is the Arima Valley, which provides the only road route over the Northern Range E-W ridge to Blanchisseuse; roads and travel are challenging, circuitous and crumbling! 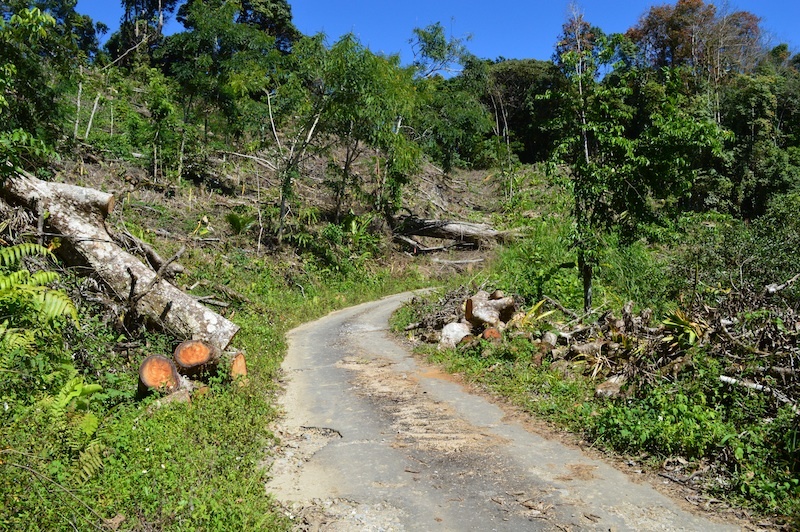 There is an evident increase in local deforestation by squatters and their “gardens”, as well as quarrying activities. Should we be concerned? Yes! And yet, who initially built all these winding access routes with their retaining walls, abutments and cuttings, ever subject to erosion and slumping? How much do any of us genuinely do to curb the exploitation of natural resources (sensu coal, oil and minerals)? 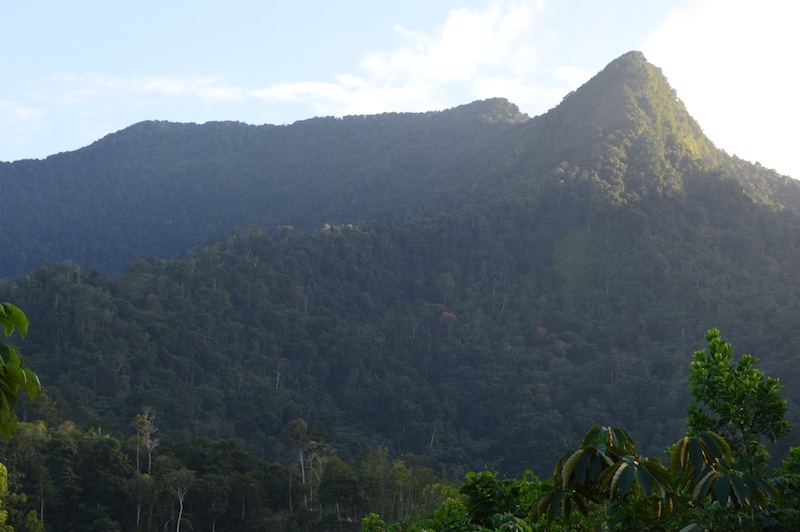 The primary forest is restricted to the steep N faces of the range, particularly around Aripo. 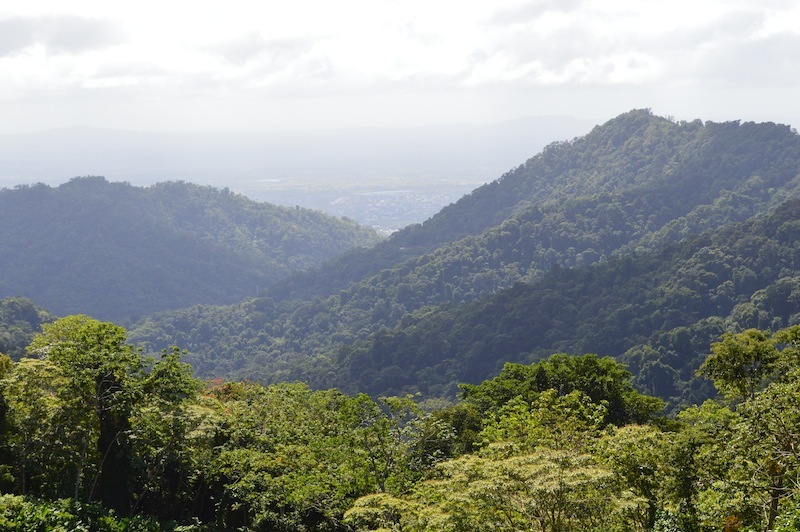 We are hoping to work with the Government and Yasmin Baksh-Comeau at the National Herbarium of Trinidad to quantify the water storage of montane forests and help to protect watersheds. Why Trinidad? 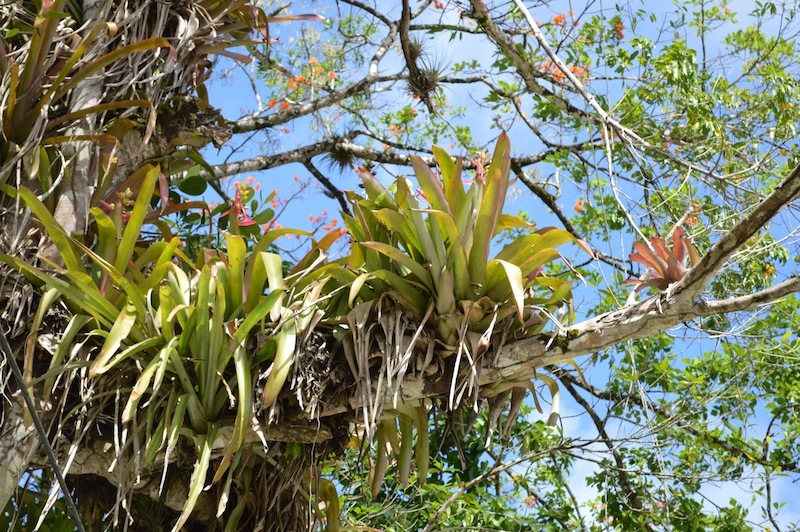 Well HG started here over 30 years ago to define the physecol of the epiphytic bromeliads. 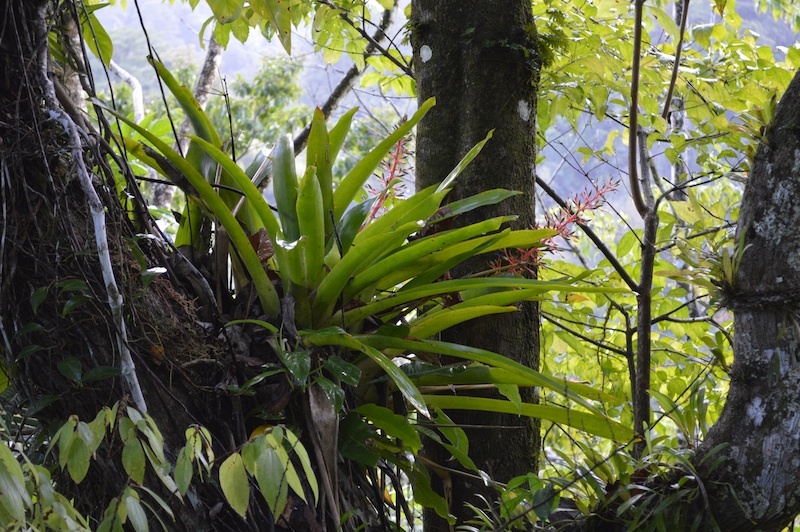 Since that time he has harboured a longstanding obsession with the striking segregation of two large CAM species, one lowland and extending up into the valleys (Aechmea aquilega), seemingly being replaced by that peculiarity of CAM in montane tropical forests, here seen as A. fendleri. And now young Jamie has been infected with said obsession, so were our preliminary observations correct across all of those ridges and valleys? We will report in a subsequent blog! Meanwhile, we are dedicated to envelope filling- whether for distributional data points and their altitudes across N and S slopes, or herbarium voucher specimens for any novel observations encountered. [that’s enough envelope jokes, Ed.] Challenging, tiring but uplifting stuff, where the friendliness of the locals is constantly tempered by warnings of violence and drug-related tensions. Meanwhile, the tremendous efforts of the Field Naturalists of Trinidad and Tobago (ttfnc.org/‎) do much to popularise interest and appreciation of the forests. We travel light, unkept and with fingers crossed- vigilant at all times whether for bromeliads in the forests, or potholes and oncoming vehicles on the roads. Currently, the developed world seems content to accept that financial stringency is a price worth paying for bankers’ excesses. Meanwhile, anyone advocating strategies to meet the cost of mitigation and adaptation climate change are close to being vilified as scaremongering extremists. Yet, it seems that multinational corporations by and large accept the prognoses of the Stern report (http://bit.ly/1cdiDDx), and are examining strategies to protect their resource inputs and supply chains for the future (http://bit.ly/18bOlFo). Of course, the problem is one of timing: hang around for 100 million years, and the current shift in CO2 and GHG emissions will appear as a mere blip in the geological record; but hanging in for 5 years, over the standard political renewal period, fuels current expectations that living standards, economic growth, and availability of mass transportation will progressively increase. Another problem is one of resource availability, and ease of access. Fossil fuel resources have powered the astonishing technological progression in the past two centuries, using buried plant reserves which have allowed us to trade on past sunlight. It had been initially simple to mine or pump these reserves, but then increasingly difficult to exploit resources in the North Sea, Arctic and Gulf of Mexico. Now we have the prospect, or perhaps spectre, that extraordinary rendition of shale gas threatens to turn excessive US energy consumption from net importer to exporter (Hughes JD 2013 Nature 494, 307–308 doi:10.1038/494307a). Yet using current solar capture systems, we could meet the annual global demand for energy via sunlight, perhaps, from an area 1,000 x 1000 kilometers of the Sahara (equivalent to x4 the area of the UK: David Mackay, 2009 Sustainable Energy, UIT Cambridge, or http://www.withouthotair.com). Where is the investment, the vision, the technology to exploit this “free” source of energy? Recent governments have been seemingly indifferent to development of industry technologies to exploit renewables and improve energy efficiency in our housing and business stock. The UK should take a lead and set an example of best practice and embrace the mixed energy generation strategies proposed by Mackay. Say no to nimbyism and do it in your own backyard! Can we afford to be indifferent, risk the compelling IPCC evidence that man-made climate change is a 95% certainty, and still look our grandchildren in the eye? What will it take to break us from our complacent acceptance of the climatic status quo, the political oxymoron of “sustainable growth” and the short-termist mentality embodied by the “out for nowt and here’s me barrow”- cheap flights, cheap clothes, cheap food is taken for granted by all. And what will it take to convince the general public that we need to act, and quickly, to limit fossil fuel consumption and curb GHG emissions? Will we need to wait for several more “100 year” extreme climatic events in short order, leading to more human suffering, death and destruction, only this time in an area where real estate is valued considerably more than a few square metres of tin shack and their unfortunate human occupants in the Philippines? So rather than allowing this agenda to be buried, let us resuscitate, rejoin and reinvigorate the climate change debate.